Keep your lawn strong and healthy with our range of dethatchers. 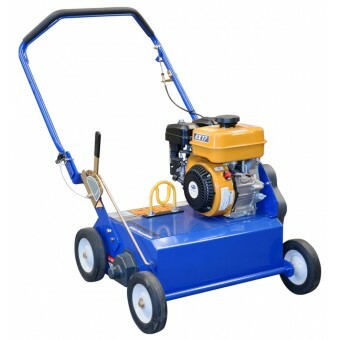 A dethatcher is a smart way to remove years of build-up of dead thatch in lawns. Thatch is the dense layer of living and dead shoots, stems, leaves, roots and chippings that accumulates between the green vegetation and soil. A thin layer of thatch is good for the lawn, as it helps moderate temperate extremes, provides cushioning and limits weed growth. But too much thatch can cause insect infestations or disease. It can prevent grass roots from growing deep, making the grass more vulnerable to stress factors. It can block water and nutrients from penetrating into the soil and doing their job. That’s where dethatchers come in. By cutting through dense layers of chippings, roots and stems, a dethatcher ensures the lawn can receive more air, water and nutrients right at the root. We stock dethatchers from Bluebird and Ings that are easy to use and built to last. Browse our range to find the right product for your lawn.